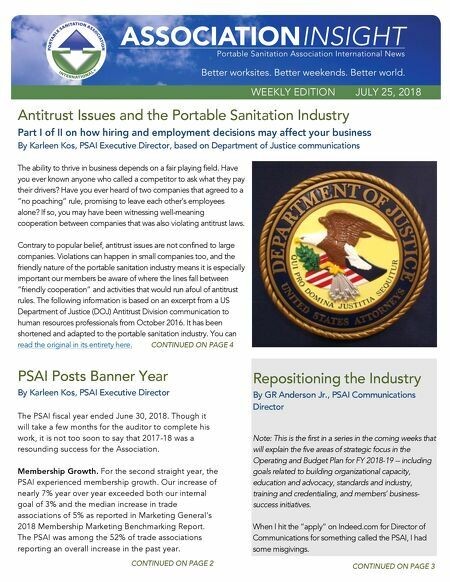 WEEKLY EDITION JULY 25, 2018 A ntit rust Issues and the Portable Sanitation Industry Part I of II on how hiring and employment decisions may affect your business By Karleen Kos, PSAI Executive Director, based on Department of Justice communications The ability to thrive in business depends on a fair playing field. Have you ever known anyone who ca lled a competitor to ask what they pay their drivers? Have you e ver heard of two companies that agreed to a "no poaching" rule, promising to leave each other's employees alone? If so, you may have been witnessing well - meaning cooperation between companies that was also violating antitrust laws. Contrary to popular belief, antitrust issues are not confined to large companies. Violations can happen in small companies too, and the friendly nature of the portable sanitation industry means it is especially impo rtant our members be aware of where the lines fall between "friendly cooperation" and activities that would run afoul of antitrust rules. The following information is based on an excerpt from a US Department of Justice (DOJ) Antitrust Division communicatio n to human resources professionals from October 2016. It has been shortened and adapted to the portable sanitation industry. You can read the original in its entirety here. CONTINUED ON PAGE 4 CONTINUED O N PAGE 3 PSAI Posts Banner Year By Karleen Kos, PSAI Executive Director The PSAI fiscal year ended June 30, 2018. Though it will take a few months for the auditor to complete his work, it is not too soon to say that 2017 - 18 was a resounding success for the Association. Membership Growth. For the second straight year, the PSAI experienced membership growth. Our increase of nearly 7% year over year exceeded both our internal goal of 3% and the median increase in trade associa tions of 5% as reported in Marketing General's 2018 Membership Marketing Benchmarking Report. The PSAI was among the 52% of trade associations reporting an overall increase in the past year. CONTINUED ON PAGE 2 Repositioning the Industry By GR Anderson Jr., PSAI Communications Director Note: This is the first in a series in the coming weeks that will explain the five areas of strategic focus in the Operating and Budget Plan for FY 2018 - 19 -- includin g goals related to building organizational capacity, education and advocacy, standards and industry, training and credentialing, and members' business - success initiatives. When I hit the "apply" on Indeed.com for Director of Communications for something c alled the PSAI , I had some misgivings.